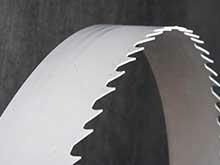 What is the proper blade tooth style we have a few types of tooth configurations for metalworking bandsaw blades IC, HP, VTH, Raker, A Raker tooth blade is available in higher TPI blades and produces smoother cuts i. The HP tooth blade has aggrieve tooth and typically features a 10° rake angle for aggressive cuts in hard or more difficult to cut steel. 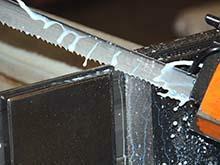 A IC tooth blade 7° rake angle for a less aggressive, smoother cut in structural steel. A 0° rake angle is also preferred in general sawing applications. Watch this video to find out what tooth style is best for you.